Warner who finished high school running for Cary in North Carolina in 2015, took up the hurdles last spring and less than three months later, finished second in the 300m Hurdles at the State 4A Championships, with a time of 42.51 seconds. Warner, who also runs the 800m in which she has earned two Carifta Games bronze medals and is coming off anchoring the the Sprint Tech Track Club's 4x100 and 4x400m Relays to BVI. Jr. National Records last weekend, made her commitment to Clemson after recruiting trips to UNLV, Miami, Illinois and Florida State. "I rounded it down to UNLV, FSU and Clemson and my final decision is Clemson," Warner who was flanked by her parents Ashley and Ann Warner said. "I based it off my visits. When I visited UNLV, I really, really liked the coaches and the coaching staff. When I visited FSU, it was the same thing-they were on the same level. I wanted to go to Clemson for a about a year and a half now, but, when I visited, I knew two hours into the visit, I was like 'this is my school. I really like this.' The coaching staff is good. 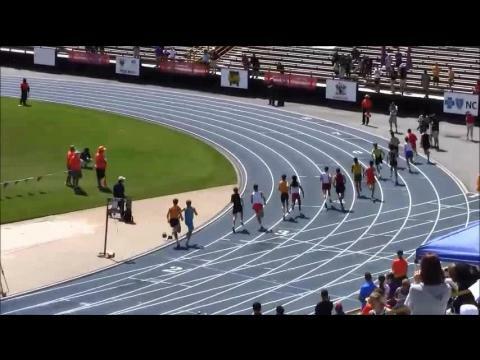 They have good sprints, hurdles and distance so all around they are really good." After she returned from Clemson on Tuesday, Warner said she started receiving all kinds of nice messages and got a little confused again. "But then I knew deep down after speaking to my coach, my parents and my sister, that I already knew where I wanted to go and I shouldn't let everybody confuse me with these nice words, because I just knew," she said. Besides sharing relay records, Warner holds BVI National Records in several individual events. Her 2 minutes 10.92 seconds in the 800m is a youth record; Her 10.50.0 in the 3000m has her name etched in the Youth, Junior and Senior records. She became the territory's first 400m hurdler to break 60 second and landed Carifta Games silver in Grenada with a run of 58.14 seconds. "Coach Mark Elliot made sure to let me know that I will be doing the 800m, just to get it in my head that I won't be doing just the 400m hurdles," she explained. "I'll step up to the challenge as I really like the hurdles as my specialty." 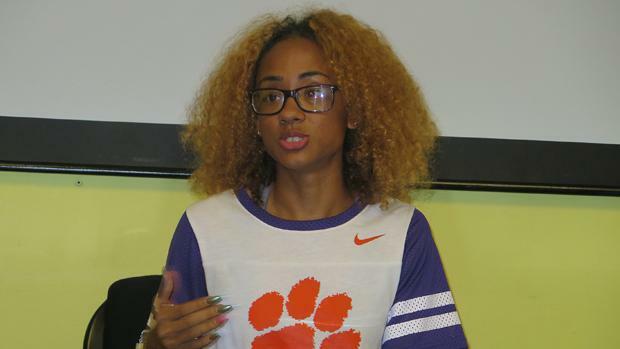 Before taking up her scholarship offer at Clemson where she's leaning towards forensic science, but is also eyeing physical therapy or psychology, Warner will end her U20 career at the IAAF World Jr. Championships in Poland, during the competition slated for July 19-24. She joins Chantel Malone, Ashley Kelly and Britney Wattley who attended Texas, Illinois and Morgan State as the fourth BVI athlete to go directly from the territory straight to a Division I institution.